Why trust "The Bish" with your leather repairs? The Premium Leather Repair Kit is ideal for upholstery on home furniture and automobile interiors, fine leather apparel, purses, shoes, booths, luggage and more! No need to replace an expensive leather couch, purse or pair of shoes when you can easily and aesthetically repair it with Tear Mender adhesive and the three shades of finishing compound. Make lifelong repairs in minutes without the use of heat or harsh solvents. 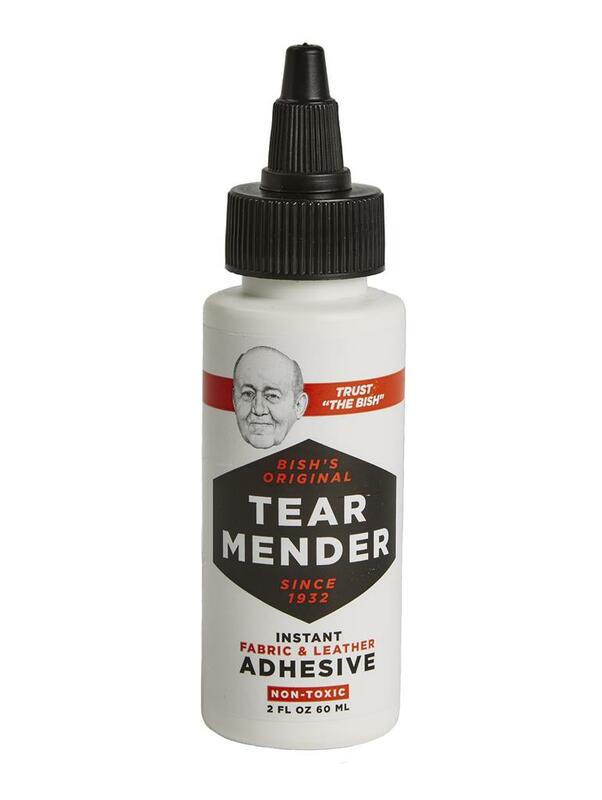 Tear Mender is a non-toxic adhesive that forms permanent, yet flexible bonds to materials it can penetrate such as fabric, leather and vinyl. The glue is acid-free and formulated with natural latex. Bonds are usable/wearable within 3 minutes and washable in 15 minutes making this product a quick fix for immediate fabric repairs. Tear Mender is ideally suited for repairs on clothing, leather, upholstery, home décor, sport/marine gear and more! 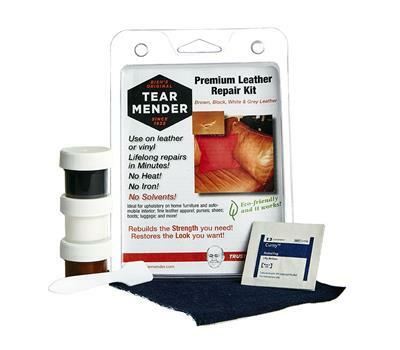 The Tear Mender TM-P-LRK Premium Leather Repair Kit is your solution for quick, easy and aesthetic leather repairs. The repair kit includes a 2 oz. bottle of Tear Mender Fabric & Leather Adhesive and a repair patch that will quickly and permanently repair ripped, torn or cracked leather. Use the surface renew compound to cover and minimize the look of the repaired area. The renew compound comes in three versatile colors including brown, black and white. These colors can be combined to create shades of grey and beige. Repairs do not require the use of an iron, heat, or solvents. The adhesive dries flexible and is waterproof, machine washable, and dry cleanable. The adhesive bonds to most fabrics in three minutes and is machine washable and dry cleanable within 15 minutes. It is fully cured on leather after two hours. The 2 oz. bottle can be used for up to 50 repairs on areas sized 2" x 2."